Once I had the biopsy and was discharged from the hospital I began going through chemotherapy to treat the tumor. I had my first chemo treatment about ten days to two weeks after I was released from the hospital. Every Thursday I drive down to CHOP’s Wood Center where the oncology day hospital is located. I’ve now completed the first four weeks of my intensive period treatment, which means I have six weeks left. The process that I go through every Thursday has lots of steps so I thought I’d run through them. 1. Check In (8:30 – 9:00 AM) – This step couldn’t be much simpler (or obvious). Once I arrive my dad and I fill out a form to check in. After a short wait we’re called up to the front desk where I’m given a wrist band with all of my information. My dad also checks to make sure all of my contact and insurance information is up to date. 2. Vital Signs (9:00 – 9:10 AM) – The first real step of the process is a nurse calls me back to take my vital signs. They take my weight, height, blood pressure and temperature. 3. IV (9:20 – 9:30 AM)- Once they’ve taken my vital signs a nurse then calls me back to get an IV. I almost always get the IV in my right hand. However, the first week I got the IV in my left hand and it didn’t go so well. 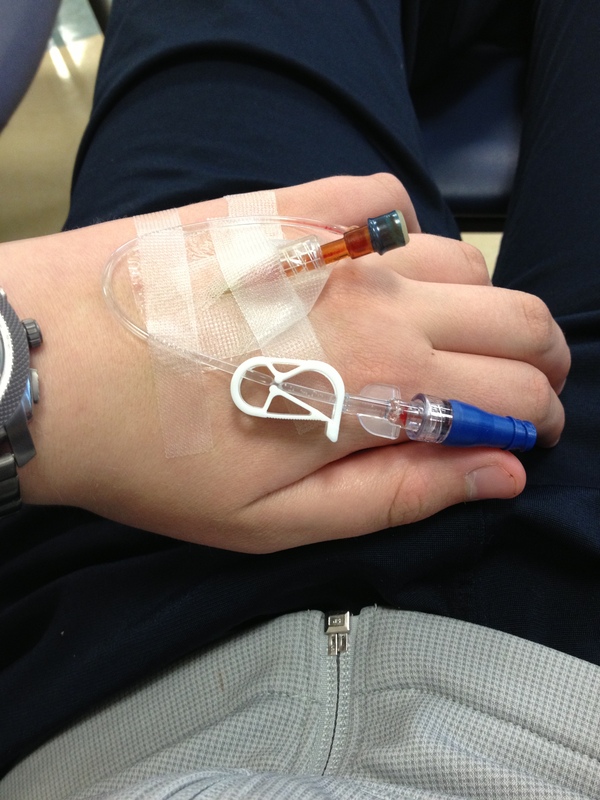 The photo below is from my very first IV which they did in my left hand, and haven’t done since. When they put in the IV they also draw blood to check my blood counts. 4. Meet with Oncologist (10:00 – 11:00 AM)- After I’ve received the IV my family and I normally have to wait awhile before meeting with my oncologist. From what I’ve heard they always wait to meet with the oncologist until the blood work is back – that’s why there is always some waiting involved. The oncologist reviews my blood counts with my dad and I and checks to make sure there aren’t any drastic changes from the week before. They say that for many of the counts they’re looking at that it’s normal to see decreases – they just don’t want to see any crazy changes from the week before. Finally, if everything is going well, I have a quick examination from my oncologist who mainly checks my eyes (as I was having double vision before) and my reflexes. Apparently it’s normal to see reflexes decrease on chemo, however just like with everything else, they don’t want to see anything drastic. 5. Day Hospital/Chemo (11:00 AM – 2:00 PM) – Finally, if everything goes smoothly I’m taken back to the day hospital where I sit in a big comfy chair and receive my chemo. Once we’re back in the day hospital if often takes my chemo awhile to arrive. However, once the chemo does arrive everything goes very fast. The first medicine I take is called Zofran, which is to prevent the nausea that the chemo causes (25 minutes). Then I have my first chemo called Vancristine (10 minutes). The Vancristine, in my opinion is always the strongest and almost instantly causes a feeling of fatigue. That’s why after the Vancristine when I receive the Carboplatin I normally sleep through the majority of the treatment. The Carboplatin lasts about an hour, so it’s always a bonus when I sleep through it. The chemo normally makes me feel pretty sick the day after, Friday, and sometimes into Saturday. However, always by the end of the weekend at the latest I’m feeling pretty good again. I take Zofran, the exact same medicine I’m given before I receive the chemo, in a pill form if I’m feel nausea. The Zofran in the pill form seems to work better sometimes more than others. The times I listed with each step above are somewhat of a rough outline of the routine. Every week is different, however, I thought I’d show roughly how long each step takes. The gaps between each step represents time spent waiting. The bag containing my Vancristine. If you have any questions about the process feel free to leave a comment and ask. Josh, great job describing your chemo days. It doesn’t seem like that much has changed in the routine since I was taking my son to Children’s Hospital of Philadelphia (CHOP) for his chemo 20 years ago. He had non-hodgkin’s lymphoma and was on many of the same medications you are getting. 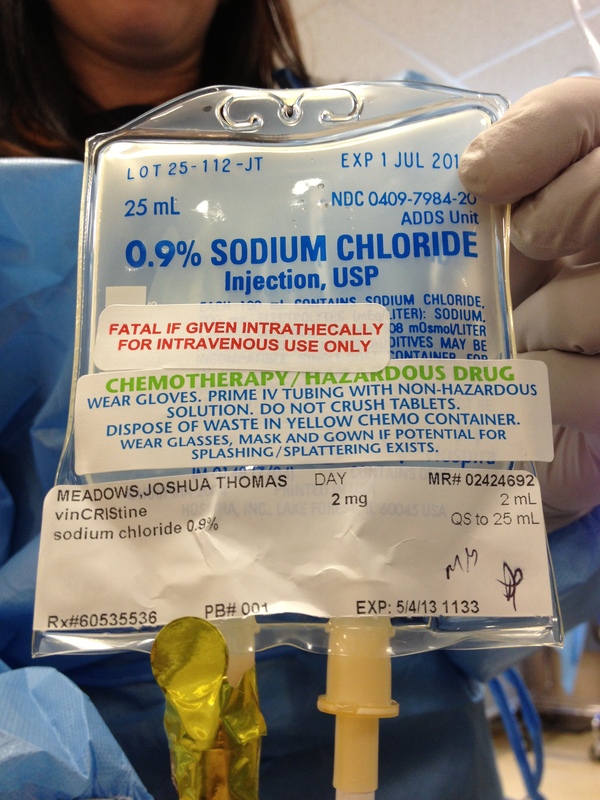 I noticed on the IV bag photo in your post, a label that states fatal if given intrathecally, that’s a scary warning. I know you are not getting intrathecal medications, so no chance of a mix up there. My son did get some chemo intrathecally, which means he was given medication injected into the space around his spinal cord. The medications for nausea weren’t as good back then and he vomited frequently after chemo. I’m happy to hear that doesn’t seem to be as much of a problem for you. Even without vomiting and without spinal injections, going through chemo has to be incredibly difficult, especially for a teenager. It sounds as if things are going very smoothly, which is great. If you do get to any bumps (bad days) know that you have many people rooting for you and sending best wishes for a quick recovery everyday. I also meant to say, I’m an English teacher in Alaska and am very impressed with your writing. Keep up the writing! Thanks for commenting. The doctors did talk about putting in a port. However, after coming right out of surgery, the last thing I wanted to do was go back into surgery for a port. I’ve decided to see how the intensive period goes and then reconsider whether I should get a port or not. It’s not that I have issues getting the IV inserted, it’s simply that I dislike them. Thank you for the update and the upbeat assessment of your treatment. Though your writing seems to insist that you are taking it in stride I am sure its not easy. I appreciate knowing you are doing well and contributing to the understanding of others. Looking forward to more updates. I will keep you in the light. Thank you for sharing your experience with us. I am buoyed to hear that you are taking it in stride, but know that it must be hard. I appreciate that you are sharing this information with the world and know that for you this journal will be an incredible artifact for you in the future. I am smiling to know that you are determined and brave. I will keep you in the light.